Superminis and city cars | What Car? In the past, you bought a small Kia only because it cost next to nothing. Things are different now. 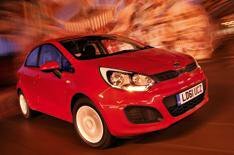 The latest Kia Rio offers all the qualities supermini buyers expect, while still undercutting key rivals on price. Our favourite Rio model will set you back less than 10,500 after discounts. On top of that, it holds its value well and is cheap to run. A seven-year warranty adds to the Rio's appeal, while standard equipment on the 1 Air includes six airbags, stability control, Bluetooth and air-conditioning. The Rio is also one of the most practical cars in the class; it has more than enough space for four six-footers, and has a large boot, while the cabin is smartly styled, solidly built and well laid out. True, the Rio doesn't feel quite as sharp or agile as a Ford Fiesta, but it does offer impressive high-speed stability and handling that's safe and predictable. Even the tiny 1.25-litre engine performs pretty well if you're prepared to rev it. Anyone after a bargain will find it hard to look past the Hyundai i10. Five doors make it a practical choice, and even the entry-level Classic comes with air-conditioning, four airbags and an iPod socket. The Volkswagen Up is happy everywhere, not just in the city. Interior quality adds to the feeling of a lot of car for the money, as does standard equipment on our favourite High Up; even sat-nav is included. The Seat Ibiza uses VW Polo mechanicals and technology, but not the VW badge, so it's cheaper. Running costs and equipment are just as competitive. Ride and handling are composed, and it looks good. Plenty of superminis undercut the A1, but value is about more than what you pay the dealer. Audi's baby will be worth more than any rivals at resale time. What's more, it feels like a real premium car.